Don’t eat the spare tire! Overcast skies greet me and the crew. It’s around 7:30 in the morning and we’re making our way up to our favorite overlook. It’s warmer than usual for this early in the day. I think I detect the smell of rain in the breeze. Spike and Bridget detect several scents, and I let them follow their noses, causing our route to become circuitous. I’m not going to hurry us back. The coffee can wait. The weather isn’t going to stay this inviting. If Spike and Bridget get plenty of exercise today, they’ll be more agreeable to snoozing inside tomorrow. We make it to the top and stand together, viewing the desert valley below. No sign of any cattle this morning. The cowboy did a good job rounding them up. Scanning the hills and dales below, I see no movement at all, and it’s too early to watch the big, black birds floating on thermal air currents. The mountains recline like bold women, lifting and dropping veils of light across their bounteous forms. I’m satisfied to view them from afar. I have no desire to drive up mountainsides to scramble on rocks and to stop my heart by peering over cliffs. Maybe I’m getting old? I put that notion aside, recalling that I’ve never been the athletic, adventurous type. On the walk back to our camp, I recognize a blessing. Thank God I don’t have any signs of arthritis. Come to think of it, I don’t remember anyone in our family having to cope with that scourge. I’m aware of how easily my legs carry me across the uneven ground. Yes, what a blessing to be able to move about like this . . . in a place like this. Bridget sees home and pulls on her leash. "Hey, Spike! I'll race you home!" I unhook them both and watch them race to the door. I love the way Bridget’s tail spins like a propeller when she runs! Our routine will continue. They’ll take a drink and I’ll put out their breakfast. While they eat, I’ll set up the percolator. I’ll open up my laptop to read comments. As I drink my coffee and type, Bridget and Spike will fall into a peaceful nap beside me. And as usual, I’ll pause and gaze out the window, grateful for this moment, this day, my life. As I finish the entry above, I hear something bumping up against the BLT. Cattle are all around us! They snoop around the tires. They peer in the windows. A black one checks out the charcoal grill. A white one starts messing around with the spare tire cover, so I stop taking photos and rap on the window. “Leave that alone! Go away!” They’re reluctant to leave — two start a game of head-butting — before finally plodding off down the lane. Here’s a slideshow. I’m sorry the photo quality is poor due to the window screen and my hurry to capture the moment! Spike and Bridget slept through it all! 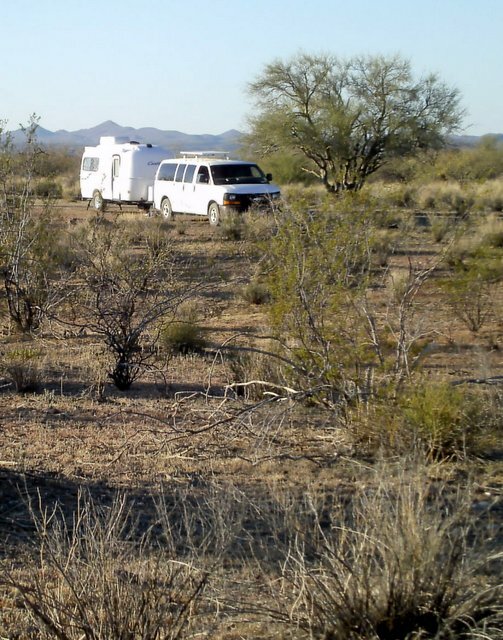 This entry was posted in Simple living and tagged Arizona, boondocking, camping, cattle, desert, dogs, life, nature. Bookmark the permalink. 47 Responses to Don’t eat the spare tire! Donna and Geri . . .
“The mountains recline like bold women, lifting and dropping veils of light across their bounteous forms” … !, just “!”. Hmmmm … Is that a good “!” or a bad “!” ? Apparently you’re speechless! The exclamation mark comes from the term “note of admiration”, in which admiration referred to its Latin sense of wonderment. One theory of its origin is that it was originally a Latin exclamation of “joy” (io), written with the “I” above the “o”. The exclamation mark was introduced into English printing in the 15th century, and was called the “sign of admiration or exclamation” or the “note of admiration” until the mid-17th century. Well then . . . Thank you! Did it make you feel like you were in a desert version of “The Birds” with Tippi Hedren? RV Sue and Crew star in “The Cows.” How funny that you didn’t see them on your walk, but they found you. When we took the road to see the Grand Canyon Skywalk there were cows wandering around on the road. I had never seen that before. What an interesting life you and the crew lead. Someday, that will be me. Line dancing! I’m so HAPPY to hear you are still being your energetic self! Have fun! You deserve it! Think the cattle have taken to you Sue, not The Crew. They just knew that those two would be fast asleep when they came a callin to check you out. Guess you have been accepted into “the herd”. Hi, Emily . . . hope all is well with you! Often times I think I fit in better with animals than people! I never did quite fit in the crowd. All is well. I have more energy than I have had for almost couple years; and, what I like I don’t seem to run down much. I am with you on fitting in with the animals – professional life with lots of people in it has reversed my use to be inclination of being around lots of people. Good news on the energy . . . I’m glad to hear it. It wasn’t until my trip in 2010 that I realized not only that cows are smart, but they are very curious. Took me by surprise. Jack started barking at a bison we came across one day, and the bison didn’t particularly take a liking to him. Fortunately, we were in the truck and I could get away when the bison started to move. When I had Lizzie, we were walking and one came up over a rise and was feet from us. Caught me by surprise. Thank goodness it was Lizzie and not Jack. She kept quiet and stood very still as the bison looked us up and down, then turned around and went back over the rise. Later that night I had to have emergency surgery, and my surgeon had just operated on a man who was in the same spot as Lizzie and I had been earlier in the day, and he was taking a picture when the bison attacked him. Unfortunately, he died in surgery. Holy cow! What a story . . . You dodged the bullet that day. Your experience and the unfortunate killing of the man points out the vast difference between domesticated and wild animals. So glad you and your pets got away without a scratch. You cow friends left to post their banner, “Eat mor chikken”. Thank goodness you already had! Funny, Pat! Apparently the cattle have taken it upon themselves to inspect the grills of campers for signs of bovine meat. Next thing ya’ know, they’ll be issuing permits or collecting fines! Hi Sue, Thanks for blogging. My wife and I bought a Casita SD 17 in November. Our only camping has been in the driveway so far. I found your blog searching for Casita sites on the web and I’ve been following you ever since. You seem to stay connected most of the time but I haven’t seen you mention what gear you’re using. We plan on traveling with the Casita 4 months this summer and want to stay connected. What would you recommend for us newbies. Well, speaking newbie to newbies . . . I don’t have much gear. I use an HP laptop with four missing keys (thanks, Spike) with a Verizon air card attached. My cellphone is a Samsung cheapie from Wal-Mart with service from StraightTalk (no contract . . . pay as you go). I don’t have any special Wilson antenna or whatever. My connection is great in the wide-open spaces; not so good when in the mountains. I disappear from cyberspace frequently when in mountains. You might want to inquire on forums to get advice from people with more experience than I have. I bet you’re excited about those 4 months of summer coming soon! Have a great time! SIGH – speaking of connections on the road. I just got dropped as I tried to post this. Ok 2nd time is never as good and the first one wasn’t all that great. But here goes………. Sure wish I had not just fallen into blogging and rather researched it so I would have known about wordpress and not just started using blogger because I was at a rally where that’s what they were teaching. I really like the slide shows as a way to show a lot of pictures more easily for me and the reader. How long did the cattle hang around before they tired of you and wandered on down the road? A Wonder Spike didn’t wake up when you rapped on the window. Another wonder that the cow didn’t look up and say “huh” and go back to trying out your tire cover. Ah the possibilities if Spike had been awake. You have such a great way of making an ordinary day sound as wonderful as they all are of course. Many of us just don’t seem to notice like you do. Thanks! Well, if it’s any consolation, there are days I wish I was using Blogger, rather than WordPress. I’m surprised that Blogger doesn’t also have an easy way to post slideshows. The cows only stayed about ten minutes. Spike didn’t have a clue because he was asleep on the bed and, although he woke briefly, he saw nothing unusual so went back to sleep. At that angle he wasn’t looking down out the window at all those nosy faces! I went outside to check the BLT and noticed a lot of nose prints around the tail-light. No damage to the tire cover. Glad you enjoyed the photos, Julie . . . The crew and I will be moving northward and upward! There are several national parks north of us and lots of BLM land. Have loved your recent posts with the horses and the cattle. It’s made me more determined than ever to live this life. Waiting for the short sale of the house to go thru and wade thru the commitments that bind me, but I’m joining you one of these days. Thanks, Sue! You’re welcome, Pat, and good luck wrapping up the old life and starting the new! You were surrounded by the round up. Getting real gray and windy up here with dropping temps. I look at the mountains, Gaelyn, and think of you! They’ll probably be capped with snow tomorrow … I just heard the highest elevations are expected to receive one-two feet of snow. Stay home, stay warm and dry, and stay safe! You’ve got that right, Dave! You are a fortunate lady indeed…no “Arthur” avisiting some days…we had a horrific night one night this last week, me and hubby!! Some friends went vegetarian for several years and got rid of theirs…maybe that is what we need to do too. We do have meatless days, but tis hard to entirely go that route. Do be careful with the cows….one looked to be part brahma…and certainly don’t mess with any that are Angus…we had neighbors once with those…S C A R Y creatures they were!! “Yours” looked to be young ones too…the older bulls get very onery in most breeds. My dad raised polled herefords ( no horns) and USUALLY the bulls were ok…he got rid of one in a hurry however. He became the daddy of a range herd in Idaho. They needed a brave one to protect the herd from coyotes, etc. My grandfather raised Holsteins on his dairy farm in upstate NY. I remember he had one white cow (bull?) — don’t remember — that he called “crazy.” He kept it in a field by itself. My sisters and I were kids. We dared each other to crawl under the barb wire fence and walk up to it. I did and the dang thing charged at me. I flew through that barb wire! Sorry to hear you have arthritis. I’ve seen how people suffer with it. My dad had a holstein bull when I was a baby that charged him 3 times (and hit him) before he could get my Grandpa at the fence to help stave him off long enough to crawl under the fence to safety. MY dad got a bunch of ribs but he was fortunate it was not worse. They got rid of that bull immediately. It is really a toss up as to what bulls to have in your field. The majority of the polled hereford bulls were so laid back that neighbor dogs often ran calves to death in the field. The one Hereford bull who kept the dogs out of the field got too scary to have around…but range farmers need not worry so much as the farmers within pastures etc…they have little contact with their herds generally. You were indeed fortunate to not get hurt by the charging bull as a child! If there is a cow in heat, those bulls nearly go crazy…that is what happened when the one attacked my dad. My dad was TRYING to move him into the field with the cow, but the bull thought he was trying to keep him out!! And after all, cows are not really all that smart generally…so what can you expect? What an experience! It’s a wonder your father wasn’t killed. You really know a lot about cows,Elizabeth. Very interesting. Thanks for writing it here for us. It’s so fun to read your ongoing adventures. The cow pictures are neat and I’m glad you are doing EXACTLY what you wanted to do the WAY you wanted to do it. Thanks for the comment, Reine. You validate me and my life! The last time I went camping, at a forest campground north of Dolores, Colorado, I was taking a stroll around the circle towards evening when I spotted a white truck with reddish-orange polka-dots and smears all over it. Now I knew these were hunters, it being elk season, but I wasn’t sure what sort of country this particular camouflage was designed for. Big Rock Candy Mountain? It turns out the poor hunters had been innocently rolling down a forest road, looking for something to kill, when suddenly they found themselves captured by a herd of fat cattle and subjected to a slobber attack. Something about that dusty truck seemed delicious to the moo-rons, so they hollered for all their friends to come have a lick too. They licked and licked and licked that truck from end to end, which turned the dust to mud and spread it around in splotches and streaks. Call it the Krazy Kow Kar Wash. Despite being armed to the teeth, there was nothing practical for those guys to do. They didn’t have any tags for cattle. Honking didn’t faze the beasts. Hollering didn’t help. There were 40 or 50 of the big animals, for the most part too close packed around them to even get the doors open. The dangerous and mighty hunters had to sit there rocking back and forth and just endure it. Bump, bump, bump, slurp slurp. Prisoners of love till the cows came home. Wish I had a picture of that truck. But it was getting dark, and I didn’t have my camera with me. They were gone early the next morning. That’s quite a story, Bob! Forty or fifty big’uns! No wonder they couldn’t do anything but endure! The BLT only got a few slobbers around the tail-light. I’m glad they didn’t start butting us. Probably because they’re so young. Hi, Billybob . . . er, Joe! You really think I’m adventurous? I guess I am! Now that you mention it, I did walk up to the crazy white cow (see above) when just a kid! I take your statement “You, my dear, are definitely my idea of the adventurous type.” as a big compliment. Thank you! Glad you are enjoying this blog and photos . . . I notice you mentioned you’re missing a few keys on your HP laptop. I have two old HP laptops here that I don’t use and would be happy to send you the keys if they’ll work for you. If interested, send me an email with a picture of the keyboard or the model and which keys you want and I’ll accommodate you. Thanks, Barrie. Thoughful of you. I have the missing keys. I even bought some super glue to put them back on. Then I chickened out, afraid I’d glue them crooked or stuck to another key! Instead I touch the plastic holder that’s underneath keys. Fortunately Spikey knocked off both bracket keys which I never use, the zero key, and the comma key (kind of annoying but I manage!). I’m glad he left the consonents and vowels! Love the slide show of the horses a few days back and the cows. I wonder what our Sandy would do if she saw cows and horses so close and personal? Sandy has seen deer and wild turkeys. I hope you are ready for this coming rain. Here in Southern California it has been raining since late Friday and snow level is pretty low. Take care and watch out for running streams. Thanks, Sylvia. It’s nice to get positive feedback on my little slideshows. Speaking of coming rain, it came all right. Time for me to go write a blog entry about this crazy weather! I came across your page recently and I’m trying to find an email address to contact you on to ask if you would please consider adding a link to my website. I’d really appreciate if you could email me back.